There are two modes of networking; infrastructure mode and ad hoc mode. In infrastructure mode, we use a central device like router or Access Point to connect all devices. This central device share Internet and files among devices connected to it. If you establish a direct connection between two devices without a router or AP, it is called an ad hoc network. In ad hoc mode, we can share the Internet and data between computers. That means in an AD-Hoc network, there is no base station to control and coordinate the packet flow. Here packets are flowing from one computer to another directly and can be compared with walkie-talkies because participating devices communicate directly with each other without any third party devices. 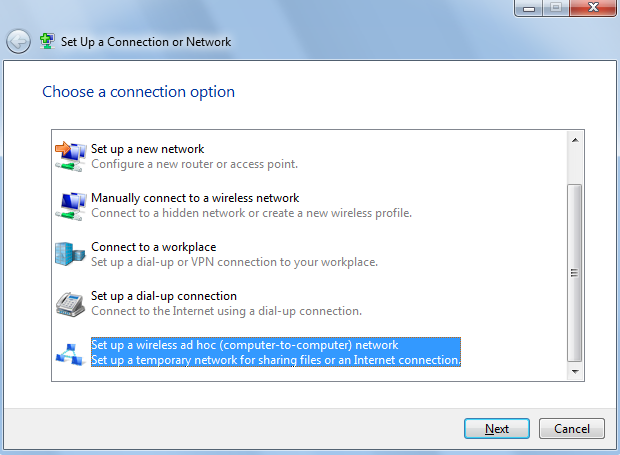 Windows support ad-hoc networking. For example, if you want to share a broadband connection on your laptop with other computers in your home, you can simply do it by establishing an ad-hoc connection. Once you have created such a network on your PC, it can connect another device in the same mode and start sharing files or broadband. To create such a connection, follow the instructions below. Now you will get a warning to keep 30 feet as the maximum distance between PCs participating in this connection. After creating the new connection, this computer will announce its presence and you can share the Internet connection between two computers using the ICS feature. To establish a connection between two computers without using a router, we need assistance from certain protocols called ad-hoc routing protocols. Here to participate to such a network without the base device, it needs to announce itself. These protocols help to automate this process. Major ad-hoc routing protocol types are Pro-active routing, Reactive routing, Flow oriented routing, Adaptive routing, and Hybrid routing. Some of them are listed below. AWDS is a Layer 2 wireless mesh routing protocol works in the Pro-active routing technology. Though seems simple, this type of connection has a maximum limit of devices supported. 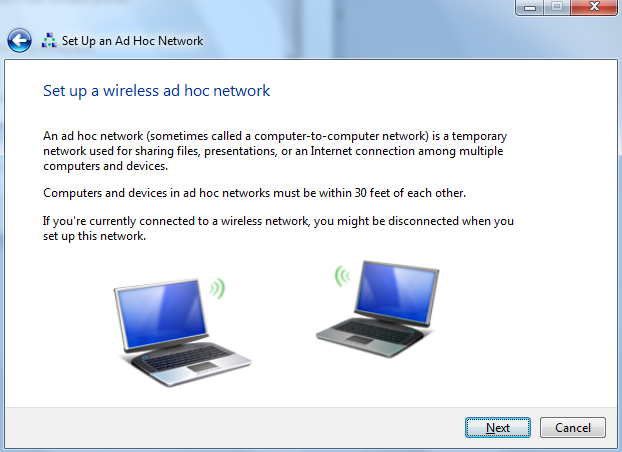 There is a maximum limit of computers that can be connected to an ad hoc connection. If you follow the link below, you will see a pdf file which explains the limitations of this type of network.